Starting at $85, our Dryer Vent Cleaning could be the best insurance policy you ever buy! Dryer Vent Cleaning, when performed correctly, will help keep your dryer operating properly and ultimately save you time doing laundry. Have you noticed drying time for normal loads is taking longer and longer. 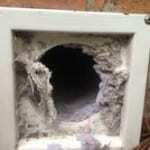 Lint build up in your dryer or dryer vents can prevent your dryer from operating correctly. Your drying time continues to increase as the lint builds up in the dryer or vents. It is a gradual change over a long period of time creating potential mechanical and electrical problems with your dryer. 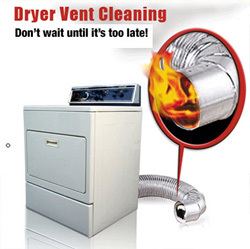 There are over 15,000 dryer vent fires every year in the United States. Over heated dryers can cause fires but it takes many unique events to cause a fire. A few insurance companies and fire departments do require dryer vents be inspected and cleaned on a regular schedule. The next time you schedule us to wash your home don’t forget to consider dryer vent cleaning. Dryer vents should be cleaned regularly and added to a checklist to ensure they are performed on a timely schedule. Your dryer vent has never been cleaned. Your dryer takes more than one cycle to dry. The top of your dryer is very hot while running. Lint is collecting on inside of dryer door. Costs less. Lowers power bill. 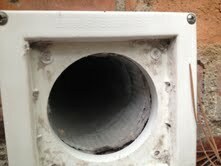 We perform vent camera inspection and air flow prior to and after every dryer vent cleaning.